Can cruising dodge the demographic iceberg? Cruise operators are building giant new ships to get younger punters on board. It's a huge gamble they can't afford to lose. Approaching the port at Southampton for my first-ever cruise I'm randomly stopped in the street by a couple gesticulating wildly towards my ship, the 1,141ft-long Quantum of the Seas, sat dominating the south-coast skyline ahead of its maiden voyage to New Jersey. It looks less like a sea vessel, more a vast apartment block whose architect has attempted to 'fun it up' by shaping one end into a point and adding some funnels. He may just be right. Some 1.7 million Brits took cruises in 2013. That's up from a mere 91,000 in 1986, according to Mintel, and accounts for 27% of all European cruise passengers. And, it seems, one trip really is never enough: last year more UK passengers took multiple cruises than took just the one. The UK market was worth £2.4bn last year. So if, as I'm starting to fear from this encounter, I'm about to be inducted into a floating cult, at least it's a lucrative one. Royal Caribbean reckons its ships contribute £120m of knock-on economic benefit to Southampton annually, for starters. And what a phenomenon those vessels are. The Quantum boasts 18 decks and is as long as 41 double-decker buses or five Boeing 747s laid end to end. If The Shard, London's tallest building, was put on its side, it would be shorter than the Quantum by about 130ft. 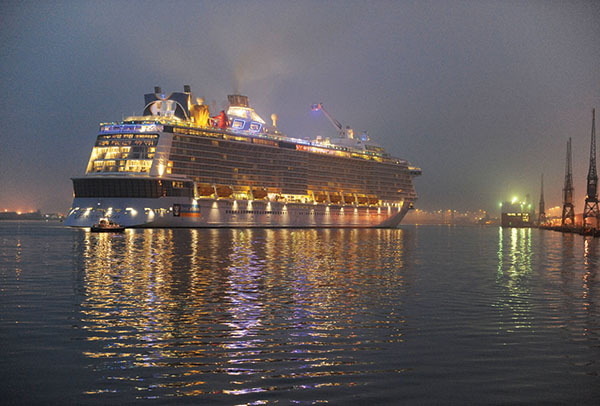 The ship can carry nearly 5,000 passengers and 1,500 crew, and took the Meyer Werft shipyard in Papenburg, Germany three years to build at a cost of EUR130,000 per berth. It has sky-diving and surfing simulators, as well as the aforementioned viewing pod, offering 360-degree panoramas from 300ft above the waves. It has been described as the most technologically advanced cruise ship ever, and as such it's the perfect illustration of just how far the cruise industry has voyaged since its early days in 1867, when a paddle-wheeler steam ship called Quaker City set out from New York to the Holy Land for a Great Pleasure Excursion. Mark Twain was among the 150 passengers who'd spent the equivalent of £1,250 apiece for the experience. What would Twain - who trained as a riverboat pilot - have made of the Quantum? As the ship made its way out of the dock, he'd have found himself inside an Abu Dhabi-style shopping mall – all glass elevators, art and sleek novelty - drinking a blue cocktail mixed for him by a robotic arm. That sums it up really. I spend the first hour aboard somewhat agog, alternately wowed and baffled by what's on offer: the decor, the glass elevators, the seaweed treatments in the spa, the 18 restaurants (including a Jamie Oliver). Technology is everywhere, from ubiquitous iPads to the virtual balconies, which offer even those with interior-facing rooms a sea view - just pull back the curtains to reveal the 80-inch flatscreen showing a real-time image of the ocean outside. An eight-day stay in a two- storey loft suite with your own dining room and concierge, en route to the Bahamas, will set you back £7,499 a head. More modest state-rooms go for £1,000 per person. 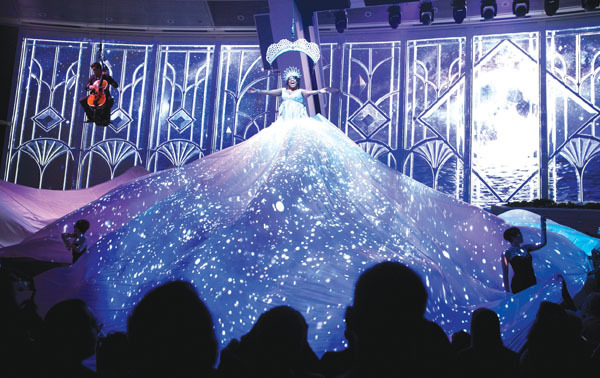 'We're appealing to people who want to experience life,' says Dominic Paul, vice-president, international, at Royal Caribbean, when I talk to him in the Quantum's exclusive Diamond Lounge about who's actually going to be holidaying on this thing. 'The cruise is becoming a richer experience,' he says. 'Twenty years ago it was special, but you had to make compromises. Now you don't need to make those compromises.' I assume he's alluding to knobbly knees, dickie bows and deck quoits. 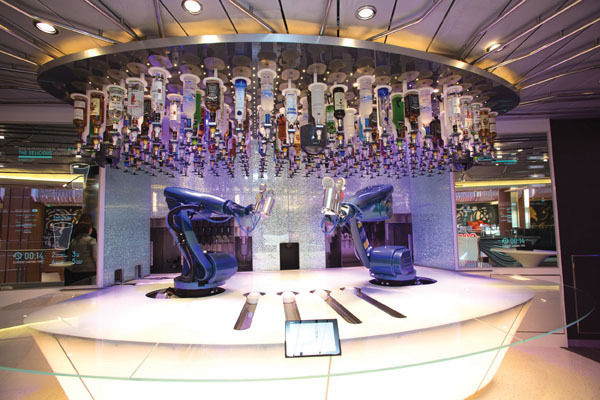 You won't find the last of these on Quantum of the Seas. In fact Paul doesn't seem to know what it is. 'Is that like shuffleboard?' he asks. When I use the on-board Wi-Fi to check that deck quoits does actually exist, I find it does, especially on board Fred Olsen Line ships, where a typically low-tech day will also include dolphin racing, bridge and big bingo. Other cruise companies offer historical lecture cruises, rock 'n' roll tours, even a fetish cruise complete with a dungeon. I fear being confined to a floating mall with a few thousand others people would be claustrophobic enough; I don't wish to be trussed up at the same time. But it all shows that these days there's more than 50 shades of cruise. 'The industry has grown into real segmentation,' says Seamus Conlon, managing director of cruise.co.uk, a major online cruise agent that will turn over £90m this year. 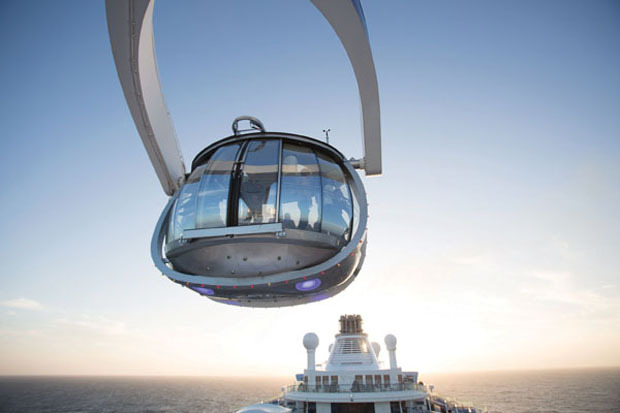 Quantum's owner, Royal Caribbean, is the world's second-largest cruise operator, with around 20% of the market. Arch-rival Carnival is an Anglo-American giant with a whopping 43% share, thanks to owning historic brands including P&O Cruises and Cunard, as well as more contemporary operations such as Costa and Princess Cruises. Other major names in cruising include Thomson, Saga, Viking and Norwegian Cruise Lines. Even Old Beardie himself, Richard Branson, is rumoured to be getting in on the action. He has apparently secured a £63m investment from Bain Capital for his Virgin Cruises venture. This is typical of most conversations I have on board. Perhaps as part of their continued drive to convert me, cruise people seem desperate to show how the image of cruising has changed. 'Look at the dodgems,' runs the modern cruise credo. But it's hard to escape the fact that the core market is older people, who have both the time to enjoy a cruise and the desire for the convenience it offers. And, thanks to the phenomenon known as the silver dollar, they're the ones with the cash. The what pound? The UN reckons the population of over-60s will more than double and pass two billion by 2050. Not only are these people better off than previous generations at the same age, they're actually better off than their kids in the traditionally spendthrift 18 to 39 bracket. According to a BofA Merrill Lynch report, The Silver Dollar, over-50s account for 50% of UK consumer spending. The FT values the silver economy at around $15trn worldwide and rising. Today's silvertops are also fitter and healthier than ever, so may well end up beating any flabby, keyboard-addicted youngsters to the top of the Quantum's climbing wall. While £1,000 a head may seem a reasonable price to a retired couple hell-bent on spending their kids' inheritance, to a typical young family it's a lot to drop on a holiday. Still, out on deck, things definitely become a bit more Butlins. It's not just the dodgems. Between the wave pool and the bar, two girls sit in a hot tub, joined by an awkward young man who's opted to keep his T-shirt on. I feel simultaneously belittled by the ostentatious wealth on show below deck, and snobbish about the massive poolside plasma screen and house music that's ruining my treasured sunset. And so we hit an inescapable fact. Cruises aren't for everyone. According to Mintel, the number taken increased by just 1.5% in 2013, following growth of only 0.1% the year before. Behind all the headline figures, the UK market has been saved from actual decline only by discounting. Average spend rose only marginally in 2011, followed by decreases in both 2012 and 2013. With pressure to fill all the capacity being created and consumers looking for good value, on-board ancillary sales of food, booze and services are giving way to all-inclusive deals and discounts. It becomes more difficult to manage costs, and the business model becomes harder to maintain. Hence ever bigger and bigger ships - where the economies of scale are so much better. This also explains the sensitivity around image. Cruise companies know they tend to end up preaching to the converted, marketing trips to existing cruisers so heavily that drawing in new blood is both essential and highly challenging. The main opportunity lies among the empty nesters - those whose kids have left home, who have not yet retired, as well as expanding into potentially lucrative new markets such as Asia and Australia. Then it's those new-to-cruisers like me, and multi-generational families. A good starting point would be cruise.co.uk's forum, which has 100,000 members, and its Q&A page, currently home to 240,000 questions - all answered by seasoned cruisers. Topics range from Ebola to how far the plug is from the mirror in a certain stateroom. Cruisers, it seems, love the details, and are more than happy to help newbies. 'There's a desire among cruisers to recruit more cruisers, to make the club bigger,' says MD Conlon. In the evening, amid the suits and cocktail dresses, I settle in to enjoy a full-blown West End performance of Mamma Mia, before taking my reservation at Chic, a vast high-end restaurant which, according to the waiter at least, has a remarkable ambience. After several reminders as to just how special Chic really is, he recommends the lamb. It arrives with what appears to be a Greggs cheese pastry. 'How was the food?' he asks. 'It was all right,' I say, hoping my tone says enough. 'Perfect,' he says. I fear this is some kind of Jedi mind trick: in half an hour I'll be recommending the lamb. And emailing my mates to get them to book a cruise. To give the Quantum and its understandably proud team its due, there is a massive range of things to do on board. The staff are excellent, the music and theatre performances faultless. The innovation, a word I hear as much as 'dodgems' and 'misconceptions', is ultimately impressive. But there's one thing conspicuously absent from all the chat: destinations. I thought that's what holidays were all about. Indeed, when we finally dock and I disembark back where I started, lashed in the face by horizontal rain, I realise I may not be getting the full cruise experience. But plenty of others are. By 2019 there will be 2.2 million cruisers in the UK, forming a market worth an estimated £3.26bn. The over-55s will keep digging into their deep pockets for a while yet. According to CLIA, UK port departures were up by 16% between 2011 and 2013, and next year looks set to be a vintage one, with two major new ships sailing out of UK - P&O's Britannia and Royal Caribbean's Anthem of the Seas, Quantum's hulking sister. But, with ships like the Quantum of the Seas taking to the briny, it appears you can.